Tailored to your College or University! Get a study abroad experience in the Incas' land. Runajambi offers unique experiential courses specifically tailored for foreign students interested in culture, health and medicine. If you are an academic administrator, please contact us for specific study abroad programs adapted to your college or university. Our program is academically rigorous and challenging, and focuses on Quichua (Indigenous People) culture, medicine, and health issues. Our courses meet the American colleges standards for obtaining academic credits. All courses are taught by professors holding M.D. / Ph.D. degrees with teaching experience in American university and colleges. Students are expected to immerse into the Quichua culture by actually living in Andean communities and learning the basics of Quichua language. We offer to our students an enriching learning experience on other ways of living, thinking and facing illness and disease. 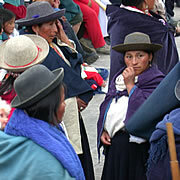 All students will interact extensively with Quichua people and scholars.